Hydraulic Hoist Market size was valued over USD 250.0 million in 2017, and the industry will grow at a CAGR of upto 5.6% up to 2025. A hydraulic hoist (chain and lever) is a material handling device used for transferring and lifting materials from one place to another. These hoists are available in two types, namely chain hoists and lever hoists. These hoists help the technical operators to shift the materials easily. 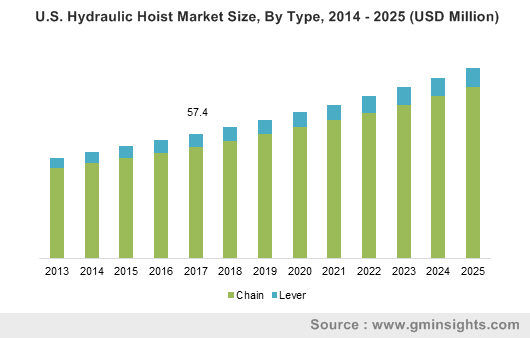 The hydraulic hoists market size is expected to increase over the forecast period, due to the increasing industrialization, growth in end-user industries, and increasing demand for material handling equipment in industry verticals such as chemical, metal, and others. The hydraulic hoists finds extensive applications in end-user industries such as metal processing, cement, chemical, mining and others. One of the major factor responsible for the growth of hydraulic chain and lever hoist market, is the increasing demand for material handling and transfer. Thus, increasing logistic businesses due to positive growth in e-commerce and retail industry will complement hydraulic chain and lever hoist market size by 2024. Urbanization and industrialization in the developing economies of Asia Pacific and Latin America, are on the rise, and the demand for hydraulic hoists is significantly increasing. Moreover, the increasing demand from mining end-user industry will also impact the growth of the manual hoist market significantly. The additional demand for hoists is from the chemical industry. The production in this vertical is rising significantly from the past few years and is expected to grow over the coming years. The hydraulic hoists finds applications in the entire chemical industry. They are used in warehouses, transferring raw materials to the production sites, etc. One of the major restraint of the hydraulic hoist market is the lack of technical expertise, coupled with increasing competition from the electric hoists. The consumers are showing much interest towards electric hoists, as they are easy to operate, and highly reliable. Moreover, the continuous service requirement of hydraulic hoists is also one of the significant factor affecting the growth of manual hoist market. The chain hydraulic hoist market held nearly 90% revenue share of in 2017. These hoists are otherwise called as chain blocks or manual chain blocks or hand chain hoists. Manual chain hoists are highly preferred by the consumers, due to their easiness to operate, and they require less service, compared to lever hoists. The chain hoists finds applications in almost all the end-user industries. Moreover, these are highly preferred in mining operations, as they require no power to operate. The manual hoist market has segmented based on their load bearing capacities. The hydraulic chain hoists have a load bearing capacity of up to 100 tons, while the lever hoists are only having less load capacity. In terms of load bearing capacity, the manual chain hoists are segmented as 0.5 - 20.0, 20.1 - 50.0, 50.1 - 75.0, and 75.1 - 100.0 tons. The chain hoists with 0.5 – 20.0 load range are predicted to have the higher market share. They held a major share of over 64% in 2017 and will grow till the end of the forecast period. The lever hoist market has been segmented into 0.5 - 5.0, 5.1 - 10.0, and 10.1 - 15.0 tons. The lever hoists have low load bearing capacities compared to hydraulic chain hoists. Among all these capacities, the manual lever hoists with 5.1 – 10.0 load capacity are the most preferred hoists. They captured a market share of over 80% in 2017 and will show a meagre growth rate till the end of the forecast period. In terms of end-user, the hydraulic hoist market has been bifurcated into metal processing, cement, automotive, chemical, mining, construction, and others which include retail, water treatment, pharmaceuticals, etc. The hydraulic hoists market for metal processing has the highest share, followed by cement, automotive, and chemical end-users. Increasing industrialization and urbanization, are creating the demand for metals such as stainless steel, and iron is rising on a constant rate, which will in turn accelerate the manual hoist market over the forecast period. For instance, the global crude steel production reached 1,689.4 million tons in 2017, from 1,620.0 million tons in 2015, increasing at a CAGR of over 4.3%. Asia Pacific hydraulic hoist market held a major share of the global market in 2017 and will lead till the end of the forecast period. The growth of Asia Pacific manual hoist market is majorly due to the increasing industrialization, coupled with rising mining activities in the economies such as Chain, and Japan. The urban population is increasing at an exponential growth rate in the developing economies like China, and India, which is increasing small and medium-scale construction activities, which require hydraulic hoists. 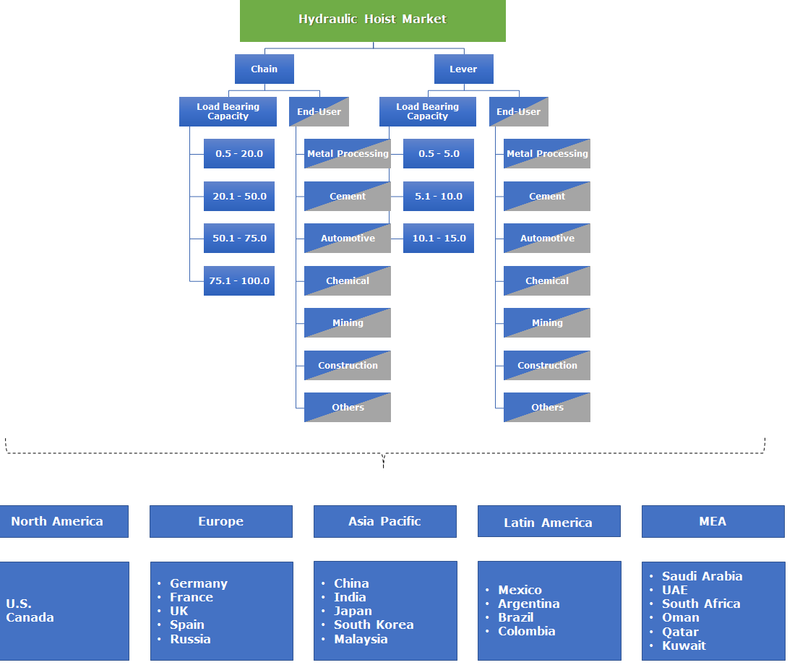 The major market share contributors of the global manual hoist market include Columbus McKinnon, Harrington Hoist, Jiangsu Jiali Hoisting Machinery Manufacturing, Konecranes, and Tiger Lifting among others. Key players are expanding their businesses through many mergers & acquisitions. For instance, CMCO had acquired STAHL, and this strategic move will help the company to increase its presence in Europe, Asia Pacific, and North America. The global hydraulic hoist market had witnessed a moderate growth over the past few years. Asia Pacific leads the industry due to strong growth indicators across key end-user’s industries of the product. Growth indicators are primarily from increasing product demand from end-users like metal processing, cement, chemical, and automotive verticals. Moreover, the increasing urbanization in some of the nations of Asia Pacific are also demanding hydraulic hoists, which will in turn accelerate the growth of this market.